One of the most common topics I discuss with my female patients concerns osteoporosis and calcium supplementation. There have been several recent studies related to calcium supplementation in the news lately and I thought it would be a great topic to discuss, particularly in conjunction with the Paleo lifestyle. Osteoporosis is a condition where bones lose strength from loss of the calcium matrix that makes them strong to begin with. Once bones start to demineralize it leaves you more susceptible to fractures. Every year millions of females fall and break their hips often leading to nursing home stays, and death from secondary infections are not uncommon. For years the mainstay of prevention for post-menopausal women has been appropriate supplementation with calcium and Vitamin D. Vitamin D is necessary for your body to be able to absorb dietary calcium. Recently these recommendations have come under fire from several areas. Before we get too far into this it’s important you discuss calcium supplementation in the context of how old the patient is and what her menopausal status is. This post is concerning post-menopausal women who do not have a diagnosis of osteoporosis. Optimum bone health is a different topic all together for pre-menopausal women as the presence of female hormones changes the game completely. Also, if a women has already been diagnosed with osteoporosis, supplementation with calcium would likely still be recommended given a risk-benefit analysis. That said, it has always been common knowledge that if you want to keep your bones strong after menopause, you need to make sure and take in enough calcium and vitamin D. Recommended daily supplements vary but often call for at least 400 IUs of Vitamin D and 1000mg of Calcium. This is in fact what I have recommended for my patients for years…but that is changing rapidly. The first problem came last year when a meta-analysis came out in the British Journal of Medicine that showed a modest increase in the risk of cardiovascular events, especially heart attacks, with routine use of calcium supplementation with or without vitamin D. The most interesting thing is that this was a meta-analysis of the Women’s Health Initiative Study, the same study we had used for years to justify our use of calcium to prevent fractures! To help you better understand the connection between calcium and vascular disease look at these pictures. The picture on the left is a normal heart, notice the relative consistency in the density of the chambers and the vessels. On the right is a diseased heart with hardened arteries. Note first the size difference, diseased hearts tend to work harder, enlarging the muscles and making it less efficient. Also notice the white spots noted by the arrows; these are the coronary arteries that supply blood flow to the heart itself. When you have a heart attack, it is these arteries that are affected. 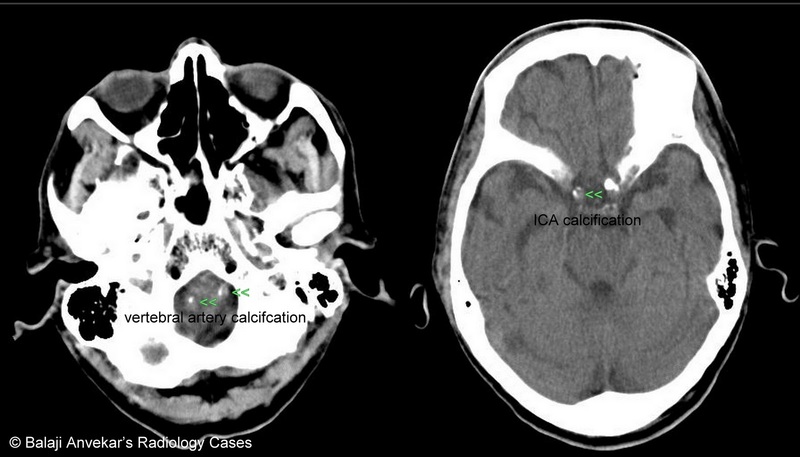 Here is an example of calcified arteries in the brain. Hardening of the arteries can happen anywhere; in the heart as above leads to heart attacks, and examples like these in the cerebral arteries lead to strokes. Calcium shows up bright white on Xray which is why bones show up that way. Note there is very little difference between the skull bones and these cerebral arteries! So you need calcium intake, but could too much intake lead to accumulation in the wrong places? This study seems to indicate that may be the case. More recently the US Preventive Services Task Force released recommendations that post-menopausal women should not take daily low doses of calcium and vitamin D to prevent bone fractures. They cited a lack of definitive evidence to show it actually works, and also pointed to the chance of increased rate of heart disease and kidney stones from too much calcium. Vitamin D has also been a hot topic of late as some say it can help prevent some cancers. The task force also reported that at this time there is insufficient evidence to support these claims. So what are we to do? The fact that there are 1.5 MILLION osteoporosis related fractures in the US every year makes this a massively important topic. 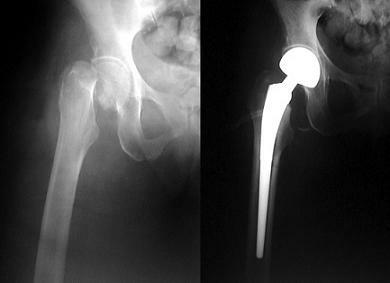 Here is what a typical femoral neck fracture looks like before and after total hip replacement. But, before we get to what to do, let’s talk about how we got here in the first place? It’s very common in medicine to find something in nature that helps prevent disease and try to replicate that benefit with supplementation. Take lycopene for example, which is found naturally in tomatoes. It was found that lycopene could reduce the risk of prostate cancer in men, so it was isolated and given to men in supplement form. Funny thing is, it only seemed to help prevent cancer when it was in a TOMATO! Supplements offered no benefit. Taking this concept to calcium, a recent study showed that females who took the recommended daily calcium dose in SUPPLEMENT form had a higher risk of heart disease, while women getting the same amount of calcium from FOOD did not have this higher risk. Imagine that, God designed calcium to strengthen your bones, but only when you eat it the way he meant you to! Listen to this statement from Suzanne Steinbaum, spokeswoman for the American Heart Association. “To tell people, ‘take calcium and vitamin D to prevent fractures as you get older.’ that’s not panning out anymore. Even if you are at risk for a fracture, maybe you have to try other lifestyle changes, like diet and weight-bearing exercise.” Don’t you like the way she put it…MAYBE you’ll just have to try actually eating right and moving around a bit! If this statement does not sum up why we have an osteoporosis problem in the first place, nothing will. There is no question that osteoporosis is on the rise. This is due to multiple reasons, but in my opinion it is from over reliance on supplementation for prevention over the traditional recommendations of dietary calcium, Vitamin D from the sun, and plenty of weight bearing exercise. Many hoped you could just stay on the couch and take some pills and all would be well. Like so many times before, we have learned that taking the easy way out just does not work. So what is a post-menopausal female to do to prevent osteoporosis? That’s pretty simple. 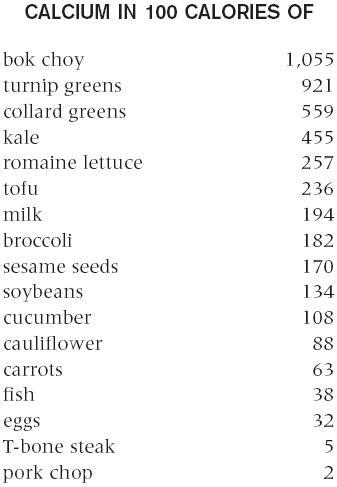 I think the recommended daily intake of Calcium still needs to be around 1000mg, but just make sure you get it from your diet, not from supplements. The take home message of these recent studies is that calcium in the form of supplements do not appear to minimize fracture risk in this population, and that they may in fact increase the risk of heart attack and kidney stones. Make an appointment and talk to your doctor about calcium and whether you should be taking it. Are you pre-menopausal? Prevention strategies will be very different for you, and again I encourage you to talk to your doctor to make sure you are on the right track. The PaleolithicMD motto is Real Food…Real Health. I can’t think of a simpler way to combine all the lessons calcium supplementation has shown us. You need more calcium, just eat it in REAL FOOD! Don’t ignore God’s gifts of calcium rich foods in favor of modern day convenience. After all, calcium pills don’t grow on trees…figs do.